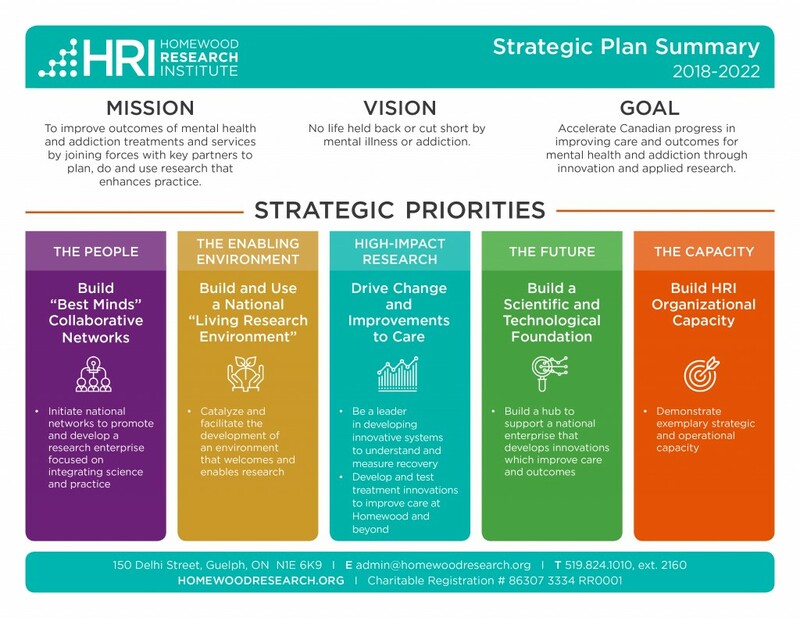 We are pleased to announce that the HRI Board has approved a new Strategic Plan, identifying the strategic priorities that will move us closer to achieving our mission to improve outcomes of mental health and addiction treatments. Over the next five years, HRI will focus on building the foundation for a national enterprise that will help to guide mental health care in Canada into the next decade and beyond. In preparation for this new phase of growth, HRI has attracted a small core group of international leaders in mental health and addiction research and evaluation. We are now set to build networks around these leaders, establish a national profile, build training programs, and bring researchers and clinical leaders together to co-create programs to improve practice. HRI will serve as a hub for the enabling of both innovative research and enhanced patient care. “As we build out these networks and programs, we look forward to joining forces with like-minded individuals and organizations, pooling resources to maximize our collective impact in addressing Canada’s mental health and addiction crisis,” says Roy Cameron, Executive Director of HRI. This entry was posted on August 11, 2017 by Heather Froome. In 2016, the Canadian Centre on Substance Use and Addiction (CCSA) partnered with the National Recovery Advisory Committee to conduct the first Canadian survey of people in recovery from addiction to drugs and alcohol. Modeled after Life in Recovery (LIR) surveys previously conducted in Australia, the United States and the United Kingdom, CCSA’s LIR study engaged 855 individuals recovering from addiction, and asked them about stigma, barriers to care, the recovery journey, and life in recovery. Individuals experience a range of challenges – including financial barriers, stigma, treatment delays, lack of services, and lack of service quality – when seeking treatment. This survey sheds light on the cost of addiction and the complexity of recovery. Importantly, CCSA notes that recovery from addiction is achievable when people have access to quality, evidence-informed services and supports. That’s where HRI comes in. We work to integrate emerging data from studies such as CCSA’s, and from our own research projects, into clinical practice. But we also extend research into the post-discharge phase of treatment, picking up where other studies leave off, to build the data-driven care that benefits individuals struggling with addiction. HRI’s Post-Discharge Outcomes Monitoring System is unique in Canada and generates data to evaluate the long-term impacts of treatment interventions. This data system will also allow for the development and testing of innovations to improve the treatment experience of patients, generate better outcomes, and offer better value for money – which, according to CCSA’s study – is exactly what Canada needs to advance addiction treatment. The Life in Recovery survey is an important step toward a systematic understanding of addiction care in Canada. Emerging data gives hope to individuals in recovery and highlights the importance of applied mental health and addictions research in Canada, which is what we do every day at HRI. Does Patient Experience Affect Addiction Treatment Outcomes? In any industry, product and service improvements are most impactful when based upon reliable feedback from those who use and benefit from those products and services. Over the past two years, HRI helped to take this research into the field of addiction treatment. Using the Ontario Perception of Care – Mental Health and Addictions (OPOC-MHA) tool – an evidence-based tool that standardizes how mental health and addiction agencies obtain feedback about client perceptions of care – HRI, in partnership with Homewood Health Centre, has collected data to shed light on the relationship between perceptions of care and post-discharge outcomes in residential care. This work was part of a larger initiative led by Dr. Brian Rush, who co-developed the OPOC-MHA tool, to test it in a variety of treatment settings; Homewood was the only site to test the OPOC-MHA tool in a residential care facility. As part of HRI’s Post-Discharge Outcomes Monitoring System, which measures recovery-oriented outcomes up to one year post-discharge, the 38-item OPOC-MHA survey tool was administered to patients of Homewood Health Centre’s residential addiction program. 215 participants completed the baseline, discharge and one-month post-discharge questionnaires. The OPOC-MHA tool measures seven domains, including access and entry to services, services provided, participation and rights, environment, discharge, and the overall experience (including service quality). The focus of HRI’s analyses was OPOC-MHA item 31, which rates service quality and can be considered a proxy measure for overall patient satisfaction. In other words, delivering quality services matters. Perception of care may be an important indicator for addiction services providers to monitor regularly, since it relates to patient recovery outcomes. HRI, in collaboration with Dr. Rush, has prepared an abstract to be presented at the 2017 Issues of Substance Conference in November 2017, in Calgary, Alberta. HRI is also preparing a manuscript for publication, detailing our research findings related to the importance of perception of care and its implications for improved patient outcomes. The HRI–Homewood study and other projects led by Dr. Rush have established the value of the OPOC tool. Based on this research, it is now being used at Homewood and across Ontario. To learn more about the Ontario Perception of Care – Mental Health and Addictions tool, click here. For continued updates on HRI’s research around perceptions of care, subscribe to our newsletter, HRI Connects, or visit homewoodresearch.org. 1. Doyle, C., Lennox, L., Bell, D. (2013) A systematic review of evidence on the links between patient experience and clinical safety and effectiveness. BMH Open Access, 3:e001570. This entry was posted on August 10, 2017 by Heather Froome.